When they [the magi] had gone, an angel of the Lord appeared to Joseph in a dream. “Get up,” he said, “take the child and his mother and escape to Egypt. Stay there until I tell you, for Herod is going to search for the child to kill him.” So he got up, took the child and his mother during the night and left for Egypt, where he stayed until the death of Herod. And so was fulfilled what the Lord had said through the prophet: “Out of Egypt I called my son.” When Herod realized that he had been outwitted by the Magi, he was furious, and he gave orders to kill all the boys in Bethlehem and its vicinity who were two years old and under, in accordance with the time he had learned from the Magi. Then what was said through the prophet Jeremiah was fulfilled: “A voice is heard in Ramah, weeping and great mourning, Rachel weeping for her children and refusing to be comforted, because they are no more.” Matthew 2:13-18. Herod is most infamously known for the slaughter of the infants in Bethlehem. Why did he take such action? By blood, Herod was not Jewish. He was Idumean, a variation of the term “Edomite,” meaning that he was descendant of Jacob’s brother Esau, and historical enemy of the Israelites. His people had been conquered and forcibly converted to Judaism. So how did he become King of the Jews? In the second century before Christ. Jewish rebels lead by the priestly Hasmonean family defeated the Syrian army of the Seleucid Emperor Antiochus IV who had prohibited the Jewish religion and defiled the temple in Jerusalem. A century later, the Hasmonean ruler struggled to keep control of the country in the face of renewed efforts by the Seleucids and asked Rome for help. The Romans did help the Hasmoneans, then helped themselves to the Jewish land. General Pompey captured Jerusalem and entered the Holy of Holies, defiling the Temple and earning the hatred of the Jewish people. But Middle Eastern politics was only a small part of the overall turmoil. Julius Caesar gained power in Rome, only to be assassinated. His friend Mark Anthony and great-nephew Octavian (later known as Caesar Augustus) took power, only to fight each other later. Herod’s father Antipater managed to support the winning side as the fluid situation changed. Julius Caesar made him a Roman citizen and appointed him as procurator of Judea. When Antipater was poisoned in 43 BC, Mark Anthony made Herod and his brother Phasael the joint rulers. Phasael was killed in battle during an invasion by the Parthians who placed Antigonus, the last Hasmonean, on the throne. Herod fled to Rome where he was declared king of the Jews by the Roman senate in 40 B.C. Then he returned to fight for his crown. In 37 B.C. Herod overthrew Antigonus and started the Herodian Dynasty. So why does this history matter? First, he had to fight to obtain power then work hard to keep it. Herod was rejected by the people as a fake Jew, the puppet king of the Roman conquerors. He tried to bribe the support of the people by rebuilding the Temple in Jerusalem, but also built temples to Caesar. Although an able ruler, he felt insecure, and brutally suppressed dissent. To legitimize his claim to the throne, he married the Hasmonean princess Miriamne, then murdered her and his own sons by her when suspicious that they might rally the Jews against him. Caesar Augustus, knowing of the refusal of Jews to eat pork, supposedly said that he would rather be Herod’s pig than Herod’s son. So imagine his discomfort when approached by a group of magi coming to worship the newborn King of the Jews! Another challenger to HIS throne! He had to be furious, but he was also a cunning manipulator. Herod masked his feelings and pretended to cooperate, with a view to learning the location of the baby and eliminating the competition. Of course, God frustrated his plans. But the slaughter also fulfilled the prophecy by Jeremiah. 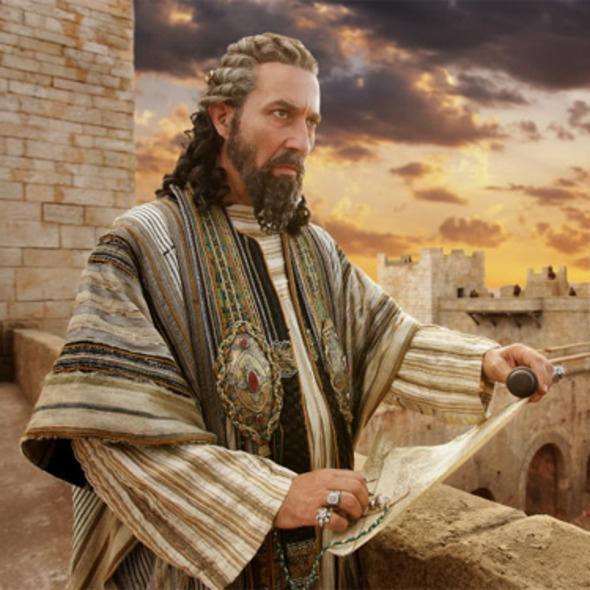 What happened to Herod? In the end, he died of terribly painful disease. The historian Josephus reported that Herod knew that the people hated him, so to ensure that someone would mourn at his death, he gave orders to execute a large number of prominent Jewish men immediately after his death, which command was fortunately disobeyed. In the past few weeks, we have looked at various reactions to news of the birth of Jesus Christ. Mary accepted the Messiah without question, Joseph was initially skeptical but later convinced, the blue collar shepherds and white collar Magi worshiped him. But Herod rejected Him. . . . What will you do? First go and be reconciled . . . .